The Manshurian walnut is a native of China, Russian far East and North and South Korea from where it was introduced to Western gardens in 1859.. 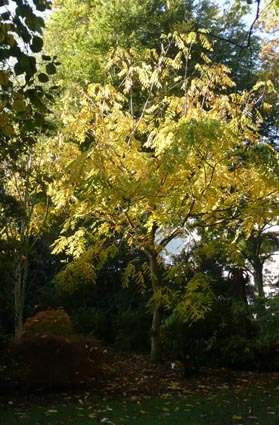 It makes a small to medium sized tree to 25m, distinguished from Juglans regia by the very long compound leaves. These can reach over 1m in length with 7 to 19 leaflets. The flowers are wind-pollinated. The fruit is smaller than that of Juglans regia and has a very tough shell making it hard work to get enough nut to be worth eating. It is grown as a landscape tree in the former European USSR. 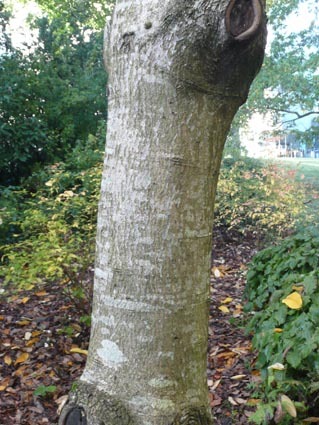 Examples in both Kew and Moscow Botanic Gardens are multi-stemmed, but the young tree in Belfast Botanic Gardens is developing with a single stem. 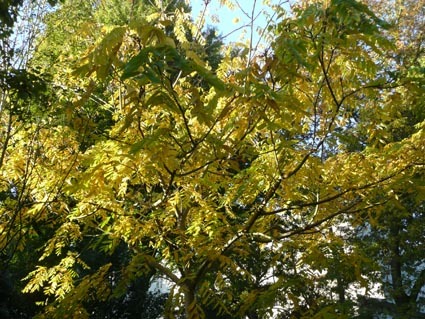 Trees of the Manchurian walnut have both male and female flowers on the same tree (ie are monoecious), but it has been shown that there are two populations; in one of which the female flowers mature before the male flowers and in the other the male flowers mature first. This reduces the chances of self-fertilization. This outbreeding mechanism was described by Darwin and is called heterodichogamy. 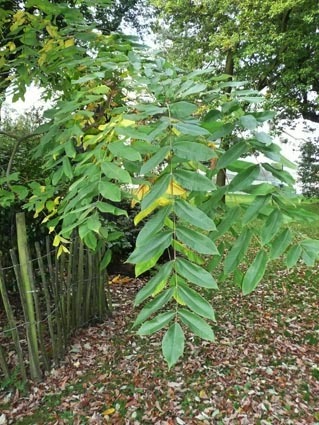 There is a lot of interest in the chemicals in the roots, leaves and bark of the Manchurian walnut whcih was used in Korean folk medicine to treat cancer. Chemicals extracted from the plant have been shown to have a toxic effect on cancer cell lines in the laboratory.